We don’t write about every Star Wars rumor that pops up online, but every now and then a story comes along that we choose to believe. This week, that story involves Breaking Bad star Aaron Paul. 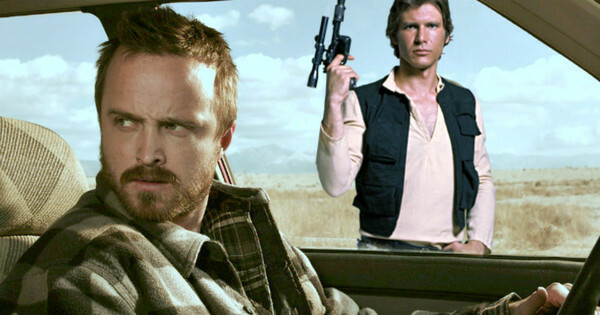 According to a fan site known as Making Star Wars, Aaron Paul has allegedly been in talks to star in one of the upcoming Star Wars spinoff films. Specifically, Paul has apparently been circling the role of young Han Solo, which would appear in Godzilla director Gareth Edwards’ 2016 franchise film. The feature, which currently has no title, is scheduled for release on December 16, 2016. The site also alleges that the film will focus on the story of Han Solo, which would mean Paul would likely be the lead actor. Considering the minor success of his last starring role (Need For Speed), this seems like a bit of a stretch in my mind. That said, stranger things have happened.